This loveable Golden Retriever is fully trained to fetch more than just a ball! This dog themed slot game has rover fetching you lots of cold hard cash. Win more than 20 times the amount won in bonus rounds! In regular play you can double your winnings with the bone scatter symbol. This exhilarating 20 line slot game allows players to bet as little as one cent or as much as a hundred dollars. Want to maximize your winnings? Then look for the Golden Retriever wild card symbol. If more than one appears in a winning combination the prize doubles! Don't miss your Chance to Fetch Loads of Cash and have hours of fun. Play Golden Retrieve Now! This game is perfect for dog lovers (and money lovers) everywhere! Join the puppies as they dig and dig until they come upon the buried treasure! 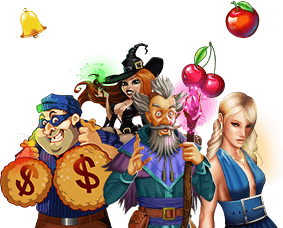 Along their way they'll come across many different objects that will still win you prizes but one they hit the priceless treasure - you're in business as the bonus round can multiply your winnings by as many as 20 times! The dog collar, dog house and dog bowl all pay out well but there's nothing a puppy loves more than a friend! That's why the female dog pays out the most (if she pops up, your winnings are doubled just like in double bonus poker)! Golden Retriever is a 20-line video slots game. Place your bets and choose the lines you'd like to bet on in order to get started. Then click on the button marked "Spin" to spin the reels. The default bet is $1.00 but bets range anywhere from $.01 - $100.00. The bonus feature in Golden Retriever is triggered when three or more scattered bone symbols appear anywhere on the reels. During the bonus feature, 10 free games are awarded and played at the lines and bet of the triggering spin. After the free games are played, the Golden Retriever digs up a multiplier (2x, 3x, 4x, 5x, 10x or 20x) and depending on which one he digs up, all prizes are multiplied and added to your bankroll accordingly. We recommend playing a few rounds of Golden Retriever in the Instant version, where you can play free slots without any restrictions and then play for real money once you've gotten a feel for the games. Substitute: This symbol acts as a wild symbol and substitutes in to help you make a winning combination. In Golden Retriever the substitute symbol is the Golden Retriever. Scatter: The scatter symbols will trigger the bonus feature. In this game, the scatter symbol is the bone and three or more will trigger the bonus round. Progressive Jackpot: The jackpot in this game is Random and can be awarded to anyone at anytime!